Summer is almost here and all over America backyard cooks are looking forward to outdoor barbecuing. In Hawaii, barbecuing is an everyday event. 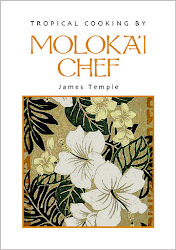 Here on Moloka'i, a lot of cooking is done on a barbecue grill, or perhaps in a China Box, because it's too hot to cook in the kitchen. 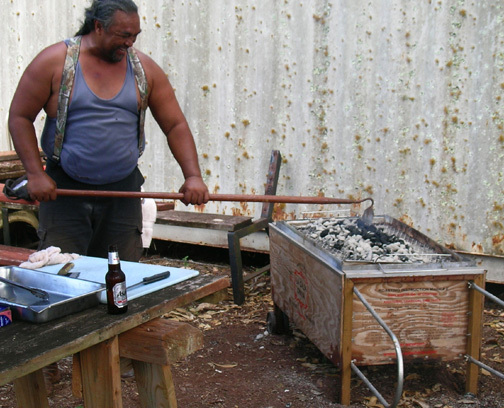 The popular barbecue grill here on Moloka'i is an old iron water heater cut in half with a welding torch, then rebar legs are welded on. It's then filled with a few dried out kiawe logs and lit on fire. When the coals are finally ready, the cooking begins. Although the usual bags of store-bought charcoal is very popular here, so is kiawe wood. 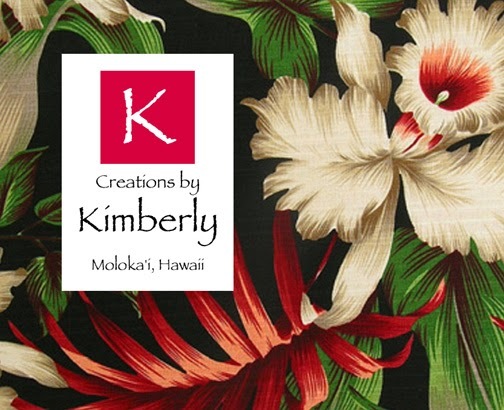 Kiawe is the Hawaiian name for mesquite wood, like they use in Texas. It's a flavorful hardwood that's great for barbecuing, and this island is loaded with kiawe trees. Kiawe wood is also used in the Hawaiian Imu, basically an underground oven (see Imu on this site for photos). It seems that like most of America, men are usually the barbecue cooks here on Moloka'i. It must have something to do with the fact that guys like to cook with fire. It's a primal thing I think. Anyway, just like everywhere, barbecuing is all about the rub, the sauce, the cooking method, and the beer. Hawaii is no different. The difference is the ethnic background of the cuisine here. 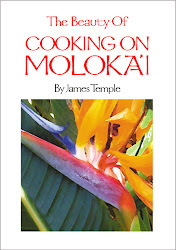 The Hawaiians have cooked over fire since they came here from Polynesia. The Koreans, Japanese, and filipinos, all bring their own spin on how barbecued food should be prepared, and it's all really good. 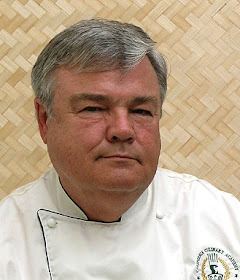 Moloka'i residents love BBQ'd oysters because they are easy to prepare and with this sauce you can't go wrong. Grilled oysters open themselves because steam builds up inside the shells until they pop open. Then you add a little barbecue sauce on each oyster, put them back on the grill to get hot and bubbly, and you’re done. Note: Oysters should be alive when you buy them. To determine whether an oyster is fresh, knock two against each other or one against the counter. If they sound hollow, throw it away. Oysters should not be open when you buy them, if they are they are dead and dangerous to eat. Oysters should not be covered in plastic because they can't breath, and will die. Keep oysters alive and cold. Here's how: Grab 2 bowls, one that fits inside the other. Unbag the oysters and put them in the smaller bowl. Fill the larger bowl with ice and put the smaller bowl inside, on top of the ice. Refrigerate covered with a cloth towel. If stored properly they will last a few days, but it's safer to cook them as soon as possible. Preheat grill to medium-high. Melt butter in a small saucepan over medium heat. Add garlic and cook, stirring, until it softens, about 1 minute. Remove from heat and stir in chili sauce (or ketchup), lime juice, hot sauce, and Tamari sauce. Bring oysters along with the sauce, a cutting board, an oven mitt, tongs and an oyster knife (or other small knife) to the grill. Place oysters flat-side up on the grill rack. Close the lid and grill until the top shell pops open, 3 to 5 minutes. Transfer the oysters to the cutting board with tongs, keeping them as level as possible so the oyster “liquor” (salty seawater) doesn’t spill out. Wear the oven mitt to hold the oyster and use the knife to remove the top shell, cutting the oyster away from the top shell and leaving it in the bottom shell. Periodically wipe your knife clean. Discard the top shells. Spoon about 1 teaspoon sauce onto each oyster. Return the oysters to the grill, close the lid and grill until the sauce is bubbling, 2 to 4 minutes more. Serve with small forks. Makes 6 pupu servings, 4 oysters each. Rinse fish and pat dry. Combine butter, soy sauce, lemon or lime juice, sugar, ginger, Worcestershire, garlic, and pepper in a large heavy zip-lock bag. Add fish and seal bag. Rotate bag to distribute marinade and place in a shallow pan. Refrigerate for at least 1 hour or up to 2 hours, turning fish occasionally. Remove fish from bag and drain, reserving marinade. Arrange fish on oiled cooking grate, to prevent fish from sticking. Place lid on grill. Cook, turning once with a wide metal spatula and brushing with reserved marinade halfway through cooking time, until fish is opaque but still moist in thickest part (8 to 10 minutes). 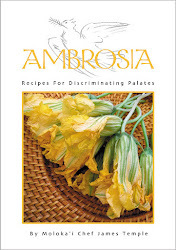 Serve with lemon or lime wedges. Makes 6 servings. Clean shrimp with kitchen sheers. It's important to leave the shells on to retain moisture. Run the tip of the sheers up the back of the shrimp and remove the vein. Snip off small legs under shrimp. Prepare brining solution in a medium size bowl, mix well. Add the shrimp and let soak for 30 minutes and up to 3 hours in the refrigerator. Remove shrimp from the brining solution and pat very dry, set aside. While the shrimp are brining, make the paste. Using mortar and pestle, smash garlic and salt into a smooth paste. Add cayenne and paprika and mix well. Add olive oil, ginger, and lemon to form a thin paste, making sure the paste isn’t too loose or it will not cling to the shrimp. Toss shrimp with paste until evenly coated. Refrigerate until ready to grill. Grill until shells are bright pink, about 2 to 3 minutes per side. Serve hot with lots of napkins. Makes 8 appetizer servings. Note: I like to put the shrimp on skewers unless the shrimp are very large because it makes turning them so quick and easy. Grill on a lightly oiled rack. It's better to grill the shrimp using charcoal rather than gas, the flavor is better. Grill over medium-high heat. Most octopus sold on the US mainland has been previously frozen. In this case no tenderizing is really necessary because freezing actually helps to tenderize octopus. Here in Hawaii, octopus it is usually prepared fresh, so tenderizing is necessary, because fresh is usually better than frozen. One way to prepare octopus for the grill is to boil it until it is tender and then lightly grill it, that is what we are doing here. To clean the octopus, wash it under running water. Turn it inside out and remove the entrails. Use a kitchen knife to slice off its bone-filled beak and rinse. Turn the octopus right side out. Put the octopus in a saucepan large enough for it, add half of the lemon, and a cup of dry white wine or sake. Add just enough water to cover the octopus and then cover with a lid. Heat on your stove on high but once boiling reduce the heat to a simmer. Cook the octopus for a maximum of 90 minutes. Cook it for less than 90 minutes if the octopus is small. Cook until the octopus is tender when pierced with the tip of a knife. Turn off the burner and then just allow the octopus to cool in the water to room temperature, about 30 minutes. Remove the tentacles from the head and if you want, cut the head into pieces as well. Rub the octopus pieces with olive oil. Heat up the grill and cook over high heat about 4 inches from the heat source. Barbecue quickly, until the edges begin to crisp and brown (be careful not burn). Drizzle on a little more olive oil, squeeze lemon on top, sprinkle with chopped parsley and minced garlic. Then just season with salt and pepper. I like to add thinly sliced roasted red pepper to the octopus for color and taste. Makes 4 servings. The Japanese have been grilling for a very long time, and yakitori dates back 400 years. "Yaki" means grilled and "tori is chicken. There are many versions of this recipe, but I love the grilled leeks with the barbecued chicken and this wonderful sauce. Cook the leeks in boiling water 5 minutes, then drain well. Thread the chicken and leek pieces alternately onto small skewers that have been soaked in water for 1/2 hour to keep them from burning. Set chicken skewers aside. To make the sauce, put all of the ingredients into a small saucepan, bring to a boil, then cook over medium heat for five minutes, or until the sauce begins to thicken slightly. Arrange the chicken and leek skewers on the grill and barbecue for 3 minutes, turning once. Brush sauce mixture over the chicken and leeks to coat them thoroughly. Turn the skewers and grill for 3 minutes more. Repeat this once more, then grill until the chicken meat is cooked through, about 15 minutes total. Remove the chicken skewers from the grill and brush once again with the sauce before serving. Serve with white rice and sliced cucumbers sprinkled with seasoned rice vinegar and sesame seeds. Makes 4 servings. Axis deer were first introduced to Moloka’i and O’ahu in 1868. Today the deer have become a major problem because of over population. 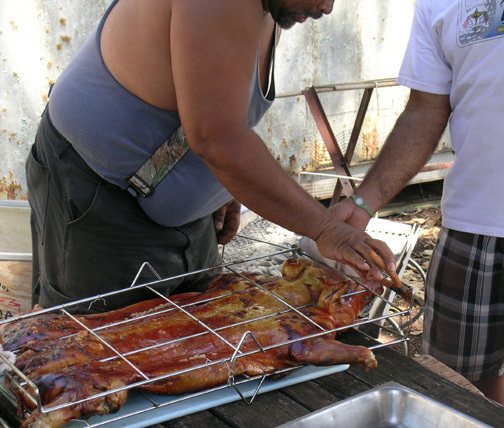 For years, hunters have enjoyed venison as a main source of protein here on Moloka'i. Normally venison here in Hawaii is either roasted or made into jerky, but this is my favorite way to prepare it on the grill. Place the lime juice, olive oil, garlic, cilantro, chili powder, cumin, and salt in a jar and shake until well mixed. Cut the venison into 2-inch cubes and marinate in the sauce for 1/2 hour. Thread meat onto skewers. Lightly coat a grill with nonstick cooking spray, heat, and grill the venison until done, about 6 minutes total. Makes 4 servings. Place ribs in a large pot and cover with cold water. Add the salt, garlic, ginger and onion. Bring to a boil, reduce heat to medium-low. Simmer for 1 hour. The ribs are now fully cooked. Now it's a matter of grilling the ribs with the sauce for flavor. Prepare the sauce while the ribs are cooking. Place the sauce ingredients in a large saucepan, bring to a boil, reduce heat to a simmer and cook for 1 hour with the lid off, stirring often. When ready to barbecue, baste the ribs with the sauce and place them on medium-hot grill. Baste frequently until ribs are well coated and heated through, being careful not to burn the sauce. Keep the ribs warm in a 250˚F oven until ready to serve. Makes 6 servings.